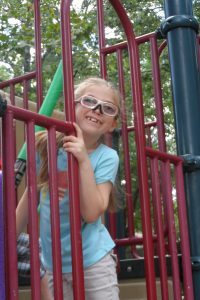 Callie nearly lost all her eyesight when she had a double retinal detachment after her kindergarten year. Her genetic condition (Stickler's Syndrome) caused some complications during her retinal surgeries that led to her developing a severe case of glaucoma. Her left eye grew under the pressure and she nearly lost both her vision and her eye. Callie had undergone such trauma with the numerous surgeries and loss of much of her vision that she could not handle office exams with lights, drops or pressure checks. The normal way to check pressure uses the stinging eye drops to numb the eye first- which always caused panic attacks and then melt downs. Callie's PTSD got to the point that all her exams were under anesthesia. When Dr. Freedman entered the picture she was able to work with Callie with an ICare to get pressures in the office and sent us home with one of the library Icare devices to monitor her. That simple act was a game changer for Callie. The Icare has been vital for us to know what is going on with her glaucoma to preserve the vision she has left. Having the Icare at home was also enormously therapeutic for her. The Icare took away an office trauma and helped her worked past her fears. She no longer has to do the exams under anesthesia and we were just recently we were able to purchase our own refurbished Icare. In addition, the ICare device has allowed us to watch daily trends with her. Watching these daily trends has allowed us to be in contact with Dr. Freedman when additional eye drops are necessary to help maintain her pressure in the ideal range. Over the past several months, we have seen it trend up. It is allowing us to be proactive with care to ensure that Callie has the benefit of continued, although limited, eyesight. Without this proactive approach, she could have more serious issues and possibly lose full vision in her eyes. All this, while saving the insurance company and our family money by not having to constantly visit the doctor's office.